Stock-exchange registered companies in occupied Western Sahara The following overview enlists stock-exchange registered companies currently operating in Western Sahara. Large Russian-Chinese-British oil study in Western Sahara With all multinational oil companies in occupied Western Sahara having abandoned their activities, the Moroccan government is trying to catch interest of new investors for further illegal oil exploration. Russian and Chinese state-owned companies, commissioned by a UK firm, are behind a large exploration programme. Cairn Energy tones down Moroccan propaganda in latest reportFollowing Cairn Energy's departure from Western Sahara, it has toned down the pro-Moroccan statements that it used to reproduce. Does OPEC consider Western Sahara to be part of Morocco? WSRW has today sent a letter to OPEC, asking the organisation to clarify its position on Western Sahara following its press release on the controversial Crans Montana Forum conference which OPEC claims takes place in "Dakhla, Morocco". Kosmos Energy maintains propaganda site after Western Sahara exit Kosmos Energy has decided to keep their website defending Western Sahara oil search - even after they have left the territory. Studies continue on Kosmos Energy's block Is Kosmos Energy undertaking a last survey on the Boujdour Maritime licence before it waves goodbye to occupied Western Sahara? Or has an unknown company taken over the licence? Last week, seabed petroleum surveys started at the place where Kosmos drilled in 2014. Kosmos and Cairn have pulled out of Western Sahara 17 years of US private company engagement in exploring the oil potential of Western Sahara has come to an end. Glencore has left occupied Western Sahara The final assets that Glencore held in oil exploration in occupied Western Sahara have been sold. Kosmos surveying oil potential near Dakhla again? Over the past 24 hours, WSRW has observed a resumed seabed exploration north of Dakhla, in the block operated by American oil company Kosmos Energy in collaboration with Scotland's Cairn Energy. Kosmos/Cairn oil study in occupied waters has ended The seismic study programme of Kosmos Energy and Cairn Energy offshore occupied Western Sahara ended on 12 April. 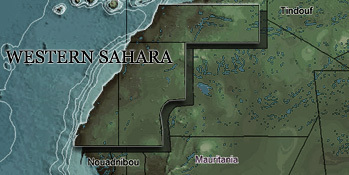 Polisario protests Kosmos/Cairn exploration in occupied waters The national liberation movement of Western Sahara has sent a protest letter to the Texas based company Kosmos Energy, that explores for oil offshore the waters of occupied Western Sahara for the Moroccan government. Here is Kosmos Energy's supply vessel in occupied Western Sahara Kosmos and Cairn Energy are exploring for oil offshore Western Sahara, occupied by Morocco. This photo taken yesterday shows one of their supply vessels. Kosmos with extensive seismic studies off occupied Western Sahara Kosmos Energy and Cairn Energy have over the last weeks undertaken another round of seismic studies offshore Western Sahara. The vessels' movements indicate the location for a new possible drilling site. Glencore steps up oil search offshore occupied Western Sahara The Swiss company is undertaking more seismic studies and has entered into a renewed contract on a neighbouring block, offshore the occupied territory. The oil companies working with Morocco in occupied Western SaharaDespite the protests from Saharawis, Morocco has to this day continued its illegal oil programme, through the Moroccan state owned oil company Office national des hydrocarbures et des mines, ONHYM. Seven oil and gas licences have so far been awarded in Western Sahara. The names of the blocks depicted on the map below use ONHYM's spelling. Scroll further down for more information about each block and its operators.